ATRS Recycling Coordinates Clothing Donations at the Race While Keeping Lips Hydrated on the Course! Nation's fastest growing textile recycler celebrated 4th consecutive year keeping Humana Rock 'N' Roll Dallas Half Marathon clean and green. I ran the Rock 'n' Roll Dallas Half Marathon this weekend not just for my love of the run but for the opportunity to promote the recycling message to other runners as well. 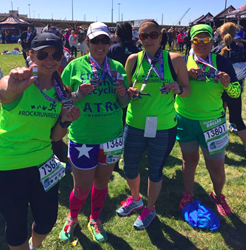 American Textile Recycling Service (ATRS) brought a familiar sea of green fairies, recycling advocates and volunteers to the Humana Rock 'n' Roll Dallas Half Marathon course this past weekend, celebrating the success of its ROCK RUN RECYCLE campaign for the fourth consecutive year. As the official textile recycler for this event, ATRS kicked off Race Weekend at the two-day Health & Fitness Expo with onsite recycling for unwanted running shoes, training gear and other apparel. Veteran runners stopped by to drop off gently used items before stocking up on new gear at the Brooks Running store. Even items no longer suitable for training or competition will still be reused by someone in need. The ATRS Recycling Fairy was on hand to debut the company's newest swag item, a miniature lip balm to keep runners lips hydrated on the course. Members of the ATRS community advocates team passed out "I HEART RECYCLING" stickers and educated many of the 18,500 attendees about the importance of donating gently used running gear year round. The early morning temperature on Race Day dipped below norms, starting at just 39 degrees. Half Marathoners huddled together in the corrals, reapplying the all natural mini lip balm before taking off through the streets of historic downtown Dallas. Four ATRS sponsored runners were also amongst the 15,000 registered runners, in full green gear and signature ROCK RUN RECYCLE tank tops. These dedicated runners showed other participants just how easy & convenient it is to donate warmup layers when the weather is cold: Skip the official gear check and wear sweaters, jackets, gloves and hats until the race starts. Then, simply remove these outer layers as temperatures climb to enjoy the sunshine and cool breeze! "I discovered running about 13 years ago with a jog around my local park, and ran my first marathon for my 40th birthday," said Josie Gutierrez, ATRS sponsored runner and San Antonio resident. "I ran the Rock 'n' Roll Dallas Half Marathon this weekend not just for my love of the run but for the opportunity to promote the recycling message to other runners as well. Knowing all the good these discarded clothes do for others is always a plus!" The ATRS Green Team, rocking their signature CLOTHING & SHOE RECYCLING shirts, followed behind the last corral of runners past the Mile 5 marker and cleared the streets of all warmup layers. Thanks to the generosity of eco-minded participants, collections totaled approximately 1,500 pounds of gently used running gear from the Health & Fitness Expo and the Race Course, along with approximately 100 pounds of unused runner medals. ATRS provided 37 cases of leftover perishable food items directly to CitySquare Food Pantry, a food bank located near the course. An additional 107 cases of water and Gatorade will be donated to assist Children's Miracle Network Hospitals and Mothers Against Drunk Driving. ATRS would like to thank all the dedicated runners, eco-minded attendees and passionate spectators that have supported the ROCK RUN RECYCLE campaign since its inception in 2013. For four consecutive years, the campaign has helped to divert thousands of pounds of donated clothes, shoes, towels and other valuable textile items from Dallas landfill and instead reused, redistributed and recycled them to benefit local charities. It’s a win win win for participants, organizers and the city! American Textile Recycling Service (ATRS) is the nation’s fastest growing textile recycler and an official recycling partner of Rock ‘n’ Roll Marathon. Its socially responsible business model provides free textile recycling solutions for the public, job stimulation worldwide and much-needed funding for worthy local charities. Easy, convenient ATRS Clothing & Shoe Donation bins are available throughout Texas, Colorado, Florida, Michigan, Tennessee, Atlanta, Oklahoma, Arizona, Indiana and Southern California. ATRS is committed to keeping textile waste from local landfills and promoting a greener tomorrow. For press inquires contact pr(at)atrsonline(dot)com.